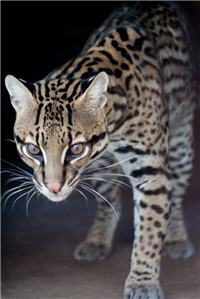 Quisto is a 10-year old Brazilian Ocelot, who is part of the Species Survival Program (SSP). We were asked to house Quisto by an Association of Zoos and Aquariums (AZA) facility, until an SSP home could be found for him. Until that day comes, we will provide this little guy with a wonderful home at In-Sync Exotics. We were told that Quisto lost his leg in an accident a couple of years ago. Despite the missing leg, Quisto is able to move around his new home without any problems. It’s amazing to watch him walk around his enclosure checking out all the sights, smells, platforms and cat walks. Quisto has never been outdoors before, so needless to say, all of this is very new and strange to him. 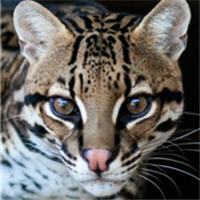 The ocelot is mostly nocturnal and very territorial. He will fight fiercely, sometimes to the death, in territorial disputes. 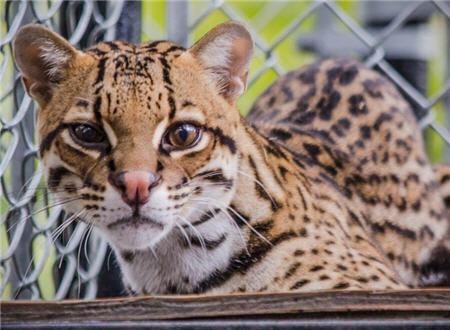 Like most felines, ocelots are solitary animals, usually meeting only to mate. So far, Quisto has been very shy of our presence, only coming out when offered small bites of chicken. We are hoping that in time, this little guy will feel very comfortable in his new home!